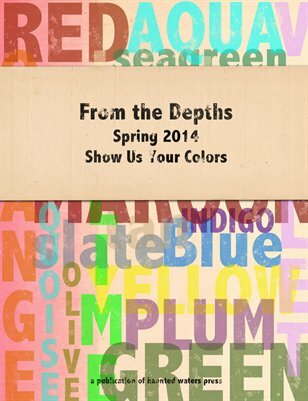 This quarter we asked our contributors to pull out all the stops and “Show Us Your Colors!” We asked them to submit works that best showcased themselves as writers in vividly written works of fiction, creative nonfiction and poetry. Featured in this issue: Sarah E N Kohrs, Shannon Winer, Jennifer Lagier, Holly Day, Clinton Van Inman, Pilar Graham, David Lipsitz, Liana Kapelke-Dale, Liz Jacoby, Tina Wayland, Patrick A. Bernardy, L.E. Huntley, Sharon Rothenfluch Cooper, Paul Barclay, M.A. Schaffner, Gail Wawrzyniak, Chelsea Dingman, Christine Thompson, O.V. Oveson, Cassandra Arnold, S. Patrick Cunningham, Dan Radmacher, Erin Khar, Toni Cogdell, Susan Newark, Michele Cacano, Nancy Meyer, Manley Peterson, Martha Pertersen, Rebecca L Dupree, Edwina J. Smith, Rosemary Douglas Lombard, Merridawn Duckler, Linda Barbosa, Adria Olson, Tom Howard, HennahBennah, Miranda Stone, Hutch Hill, A.A. Jones, Samantha Kennedy, Aaron Craig, Diane Smith, Jeff Sokoloski, Meredith Harrington, Deanna Willis.